This bag uses the Perfect Pennants Bigz die and it’s simple as can be – just tear a little chocolate trunk, embellish the edges with the Eyelet Border punch and some Dazzling Details, and add some shimmery ornaments and a Rhinestone Star at the top! 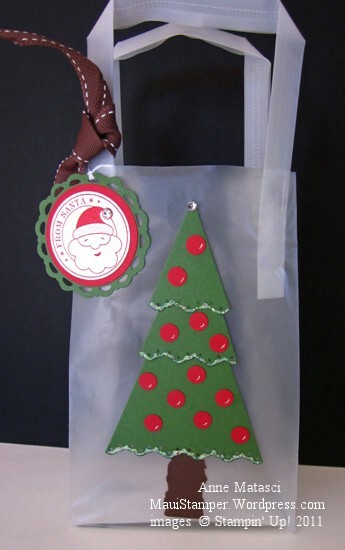 The easiest way to put this together – and attach it to the bag – is with Stampin’ Up! Glue Dots. Honestly, they make assembly a breeze and with 300 on a roll you can fly through your projects! 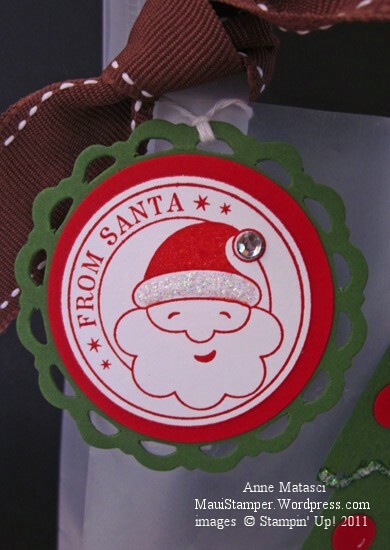 Lots of Dazzling Details and another Rhinestone Jewel give Santa some holiday bling! Just a few more days of BIG BIG savings at my Online Store! I’m sending out hand-stamped goodies with every order, and I’m drawing for fun prizes too. A gift bag for — Super Saturday!